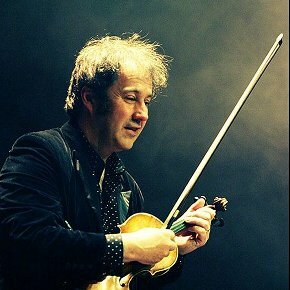 Steve Wickham was born in Dublin in 1960 and studied violin with Nell Kane at the Royal College of Music in Chatam Row, Dublin. He moved from Sligo to Dublin in 1992. Steve also plays guitar, piano, mandolin, banjo, concertina, didjeridoo, whistle, kalimba, ocarina and saw and enjoys arranging for strings. Steve continues to record and tour extensively with the Waterboys and has appeared on many of their albums including the classic ‘Fisherman’s Blues and 2011’s ‘ An Appointment with Mr. Yeats’. In 1997 and 98/99 was commisioned by the Abbey Theatre to compose music for two Irish language plays by Tom McIntyre; Caoineadh Art O Laoghaire and The Midnight Court. Following on from working with Director/Writer Michael Harding in the Abbey, Steve composed music for several of Michael Harding’s plays including ‘Sleeping a Lovesong’ and “Bogdances” and ‘Talking Through His Hat’. Last year they presented ‘Talking Through His Hat’ at Electric Picnic Theatre Tent. They hope to continue their collaboration into the future. Steve has composed for several film scores including a piece for award winning ‘A Dublin Story’ directed by Graham Cantwell, ‘Pokernight’ a Canadian short film and his compositions have appeared in films including Goodwill Hunting, Waking Ned, Lucinda’s Spell & Dream With The Fishes and most recently recording some traditional tunes for ‘The Raven’ an American film directed by James McTeigue and due out early 2012. Steve also writes and records with his own band The NoCrows based in Sligo. Previous postTony MacMahon Next postGlac páirt sa cheolfhoireann / Join the orchestra!